I recently stumbled upon a couple studies from MorningStar about different Safe Withdrawal Rates for different retirement periods in different countries. Strange enough, there is not one for the US but the ones for Canada and UK are very interesting. The interesting bit I found was the longer the retirement timeframe (ie 40 years) the higher the equity allocation did not provide a higher SWR rate at 99% probability of success. Only at much lower 'probabilities of success' did the higher equity allocations provide a higher SWR. Now the difference between these "scarily" low SWR numbers are attributed to the length of the retirement periods, home country bias and probability of success compared to the original Bengen study. Others have analyzed the data and found that for a global portfolio with no home country tilt, the SWR has been around 3.5%. However, Tyler at Portfolio Charts has outlined that there are some sound reasons for tilting one's portfolio toward one's home country, namely due to stock returns being inextricably linked to their home country's inflation. Vanguard has also found that beyond around 20% of one's portfolio, there hasn't been a significant marginal benefit to the diversification. I still think that 4% is a fine rule-of-thumb, which is all that it ever was. When you combine its low historic likelihood of failure over a 30 year period, combined with the life expectancy of those typically starting retirement, and the fact that virtually no one rigidly uses the '4% rule' and adjusts their spending according to their portfolio's performance, it's a fine starting point. Where you go from there is really up to you. Regarding the stock allocation, it's true that there isn't much additional increase in the historic likelihood of success with very high stock allocations, but you'll note that this does increase the median ending portfolio balance significantly. If I can have the same likelihood of success with an 80/20 portfolio as a 50/50, for instance, I'd rather have the expected long-term higher returns of the 80/20. "Others have analyzed the data and found that for a global portfolio with no home country tilt, the SWR has been around 3.5%." 12/20 are at 3.25% or below. Using starting dates from 1900-1986 for 30 year retirements, he found that the SAFEMAX for a 'world portfolio' was 3.45%. I always find it interesting that he gets 1937 to be the rate limiting step for the US while other people often get 1966. I am sure it is some combo of AA and fixed income instrument (corporate bonds vs tbills versus long term bonds vs cash). Of course there is a reason why the rest of the countries all have failures in the 1914-1918 and 1937-1944 range:). I have no clue how you can predicate what the odds of that type of political instability happening again is. I agree that that is indeed an interesting quirk of his findings. Also, he acknowledges that U.S. investors would have been better served with intermediate term Treasuries than the T-bills he analyzed, but the lack of good global data on that asset class led him to avoid it. A more common AA comprised of U.S. and international equities and TBM would probably have had a slightly higher SWR. And yes, the world wars ravaged many of those nations, many of them twice. For those implementing a buy-and-hold approach, I really don't know how they could really guard against those kinds of events apart from having their equities and bonds be global, but most here shy away from international bonds. "My objective is to determine how international diversification would have changed these outcomes. Are globally diversified portfolios a panacea for retirees? To determine this, I calculated the local currency returns on stocks and bonds in 20 different nations for the same GDP-weighted “world” portfolio consisting of the 20 countries in the dataset. This allowed for 20 different perspectives on the role of international diversification, which is unique. The few existing studies on withdrawals rates with international diversification have only looked in the context of U.S.-based investors. Table 2 has results comparable to Table 1, except that hypothetical retirees in each country invest 50% of their assets in a GDP-weighted portfolio of global stocks and 50% into global bonds, with returns in each country measured in terms of its local currency." "In total, global diversification resulted in higher withdrawal rates in 66.4% of the historical cases across countries. As well, globally, the success rate of the 4% rule with domestic assets was 65.7%, but it rose to 78.3% with globally diversified portfolios. This compares to the 91.7% historical success for 4% in the U.S. as seen in Table 1 (as a reminder, the 4% rule suggests that one can withdraw 4% of their retirement date assets, adjust that amount for inflation in subsequent years, and not run out of wealth for at least 30 years)." So if the "global" SWR was an unexpectedly high 3.45%, then I presume this has something to do with the choice of currency? There is not as much detail in either article as one would expect in a study published in a professional journal (or perhaps I didn't read carefully enough), so I'm not sure how the "global" SWR of 3.45% was calculated. "Keep in mind also that I am only looking at the twenty developed-market countries in the dataset, with data going back to 1900. Travel back in time to 1900, though, and ask people to put together a list of twenty developed-market countries for the twentieth century, and you would probably find frequent mention of countries like Argentina, Russia, and China, among others. As those countries never made the dataset, even the results I describe here include a degree of survivorship bias." Keep in mind that the U.S.'s outperformance of most other nations helped the 'global' SWR because it comprised such a large portion of global equities for most of that period. Many of those other nations have comparatively tiny stock markets. One could argue that during that period, the capital simply flowed to where it was treated 'best'. How do you propose that investors address the risk of nationalized economies, wiping out stocks altogether? Invest in gold, silver, brass, and lead instead? I've noticed that you have seem to have a bit of a 'doom and gloom' outlook on all of this. Believe me when I say that everyone here wants a safe, secure retirement, but the bottom line is that without knowing the future, we must recognize that all roads carry risk. There is no such thing as an absolute guarantee. Being as flexible as possible is one tool we can use to this end. The interesting bit I found was the longer the retirement timeframe (ie 40 years) the higher the equity allocation did not provide a higher SWR rate at 99% probability of success. Thanks for the links. I find this topic very interesting. 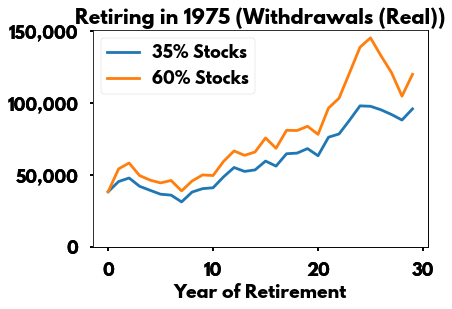 From my own research, it's pretty clear that the common assumption that higher percentages of stocks make for higher withdrawal rates is based on US-bias in the research and is not always bourne out in other countries. 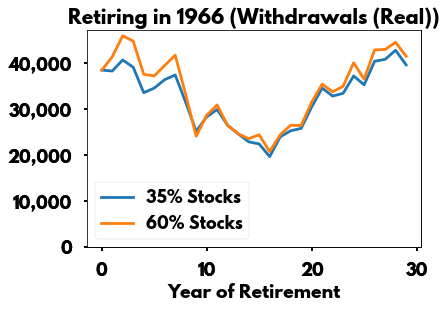 For example, if you look at the data (since 1970 -- the most I have access to) the ideal percentage of stocks for a retiree in the US was about 90%. In the UK it was about 70%, in Canada it was about 60%, and in Germany it was only 10%! Length of the timeframe to the point where it includes things like world wars certainly has a big effect on the numbers. But even today, varying inflation numbers and exchange rates between countries are vitally important in any calculations involving maintaining purchasing power. You can't simply apply a rule of thumb calculated for a very specific set of US stock and bond funds with US inflation to every other country. Each situation must be evaluated on its own merits. It isn't entirely clear from their phrasing, but I think the charts you are talking about are based on their predictions of future return expectations, not historical data. (They are in the section "Safe Withdrawal Rates - A Forward Looking Perspective".) They believe that over the next 20 years Canadian equities will return just 7.59% and US equities 6.59%, while having approximately their usual volatility. I believe those whose investments allow them to just break even with inflation on average get a 3.33% SWR in a 30 year retirement. I wonder if most people reading the Morningstar article (or the study fro Prof. Pfau) realize that the data series come from the Dimson, Mash and Staunton data set, and this data set only tracks long-term bonds... This, plus the use of a 1% expense ratio, does not make the outcome as significant as one might wish. Unfortunately, besides the US, there is no historical data set for intermediate-term bonds covering a long period of time. "In it, I made my calculations using updated data for 1900-2015 now available for twenty developed-market countries plus GDP-weighted world and world ex-US indices. The data is from the Dimson-Marsh-Staunton Global Returns Dataset provided by Ibbotson and Morningstar." "For bonds, the additional returns over bills failed to compensate for their additional volatility in a retirement income plan, so I will further consider results for the stocks and bills case. Bengen used intermediate-term government bonds—which seem to hold a sweet spot in the tradeoff between returns and volatility—to yield the highest sustainable spending, but this bond option is not available in the Global Returns Dataset. For what is available, bills work better than long-term bonds for the aforementioned reason of additional volatility. The results for the 50/50 asset allocation can be seen above in Exhibit 1." "Note: Assumptions include a 30-year retirement duration, no administrative fees, annual inflation adjustments for withdrawals and annual rebalancing." Last edited by TheNightsToCome on Wed Feb 14, 2018 9:34 pm, edited 1 time in total. You are absolutely correct. I meant to type "long-term bonds and bills", and somehow forgot two critical words! Thank you for correcting me. The essence of my point remains though. I don't see any modern investor use T-Bills or LT Bonds as the primary bonds vehicle. And I find quite unfortunate that Morningstar left out such an important piece of information (unless I missed it somewhere?). Also, a little bit of perspective might help to put things in context. Here I used the latest version of the Simba backtesting spreadsheet (where expenses ratios are more Bogleheadish), and I compared a (US-only) 80/20 portfolio with a 50/50 portfolio. Oh, and the bonds are Intermediate-Term Treasuries. 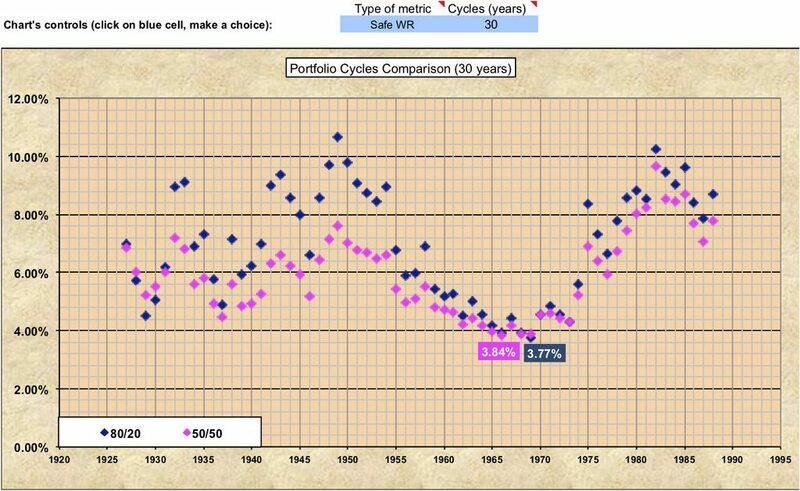 The resulting SWR for a 30-years cycle for the 50/50 portfolio is 3.84% (1966 starting year) vs. 3.77% for 80/20 (1969+). Should we conclude that the 50/50 portfolio wins, or at least that it is a tie? Let's look at the following chart first. 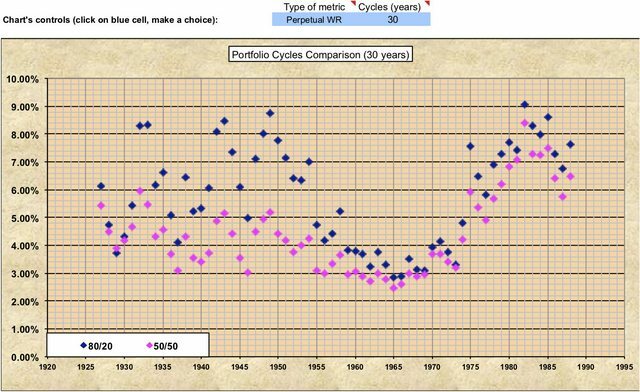 Here, each 30-years cycle is computed separately and graphed, for each starting year. Sure enough, the lowest pink point (50/50) and lowest black point (80/20) are identical to what I just described. But look closely at vertical lines. Don't you think that the black data points look better? And I am not even speaking of the scenarios like in the 40s and early 50s, but just the truly painful period of time between 1960 and 1973. Now let's switch to a Perpetual Withdrawal Rate (instead of depleting the portfolio, let's aim at coming back to its initial value, in inflation-adjusted terms). Here is the corresponding chart. Compare pink to black. Compare to the SWR chart. Interesting, isn't it? In Exhibit 2 we recreate the analysis in Exhibit 1, but instead of using historical U.S. returns we use historical returns for a Canadian investor. We also assume a portfolio fee of 1.00%. Precisely. This can be 'guaranteed' by putting 100% of your portfolio into TIPS. And truth be told, there's a small real return with TIPS as well, so you could either increase the WR or extend the period of time. Granted, this approach leaves you with little upside potential, but that's the price you pay for a government guarantee. I'll be more specific: The links to Wade Pfau's work posted by me and willthrill81, https://www.advisorperspectives.com/art ... awal-rates and https://retirementresearcher.com/4-rule ... und-world/, show the low SWRs that I discussed above. Both of those articles specify zero administrative fees. Even bogleheads pay some fees (and incur a tax drag). Therefore, the low SWRs reported are upper bounds based on historical results. Would be interesting to see the results for Wade's international diversification study with higher equity allocations than 50%. Also most safe withdrawal rate maxes occurred in the first half of the 20th century. Was this related to the world wars? What would happen if you excluded those? excuse my ramblings, but I've been giving this SWR/retirement problem a LOT of thought over the last few years. 1) at my age/BMI/smoking status etc etc my expected lifespan is ~75 years. I'm 34 now so obviously this number likely will increase as I get older and I have to also plan for my wife however she is older than me so that helps. 2) I enjoy my profession and even if I didn't I would want to be active doing SOMETHING as long as I'm physically and mentally able to do so. Therefore, I don't think it's likely I will be in "full on" retirement, with no income, travelling the world or playing golf 24/7. Unless I win the lottery, that is not my plan. I plan to continue to bring home an income for as long as I possibly can even if that means dying at work. 3) my last two points lead me to believe that the odds are GOOD (not 100% but likely) that I will have a short period of life left after my income has stopped and I am solely relying on assets/SS (I also am not one of the conspiracy theorists who think SS is going to go away entirely, it will be changed but still be in existence reason being NOBODY in this country saves a penny and we simply will not have old people rotting on our streets or living in all the basements of the country). If I had to guess, the period of time where I am too unhealthy/unable to bring home any income but still alive is likely 10-15 years, possibly far less. I don't know the future however I do work in long-term care/medicine, the fact is that very few people live all that long once they hit that "no-go" stage. 10-15 years I think is a safe calculation. A SWR of 5-7% with 70-80% in equities likely will last 20-30 years. The problem is that healthcare costs can be astronomical and it simply is not practical to plan to spend hundreds of thousands of dollars on LTC in my opinion, if it comes to it I will rely on Medicare/Medicaid as the rest of our country does. It's not perfect, its not even that great, but the fact is we don't leave the elderly dying in the streets we do as a society at least put them in facilities and take care of the their basic medical needs (Medicaid). 4) What many don't think about is the risk of losing out on life in your youth/when you are healthy. If you spend the vast majority of your time working to save for this massive retirement someday you end up losing great time in your 30s-50s that could've been spent travelling, with family, etc. and those years, in my opinion, are worth far more than the "golden years". all this being said, I have reshaped my thinking on this subject (if anyone cares). I used to study the 4% SWR extensively, have followed Wade Pfau very closely and appreciate all his work. But I have also spent the last 7 years working like a dog and it has affected my marriage in a negative way. I have done great as far as saving money but now I realize that I have given up some great years in my youth that I will not get back. I have decided to take a huge chunk of what I have saved and start taking distributions from it - I've turned it into an income stream. By doing this I have cut back from work to less than full-time and am trying to maximize my 30s-50s as much as I can and worry less about my 60s-death, if that makes sense. I am okay with the possibility of eating cat food and living in a Medicaid facility in my old age if it means I lived life to the fullest while I had young kids and the health to do so. privatefarmer....you are a young man. One, fix your marriage. A happy wife = a happy life. Focus on her. If you remember nothing else from this post - remember that. Two, smoking can be stopped. I am living proof. That is your #1 risk factor, right off the bat. Three, BMI can be reduced. I am living proof. You can do it. Start slow. You have years to reduce BMI, but you need to start first. FWIW, I suffer from a chronic condition that will likely reduce my lifespan. And I am 'it' when it comes to support. My beloved wife is a little older than me, and she is at the end of her labor capital. So I am working like a madman too. Believe me, I get it. You can take control of your behavior in your relationship, your smoking, and your BMI. This is not sermonizing, it is concern for a fellow human being. That is something I have been interested in as well. As best I could tell I came to the conclusion that an SWR of 3.5% does a pretty good job at eliminating country risk when both bonds and stocks are globally diversifed. It would not eliminate more disastrous risks associated with war but then you can't insure all risks. But I have also spent the last 7 years working like a dog and it has affected my marriage in a negative way. I have done great as far as saving money but now I realize that I have given up some great years in my youth that I will not get back. .... I am okay with the possibility of eating cat food and living in a Medicaid facility in my old age if it means I lived life to the fullest while I had young kids and the health to do so. While I think it's a big mistake to, for example, assume that 4% for 30 years is safe today for a portfolio with no ex-US equity, I also think it might be reasonable to intentionally risk running out of money or needing to return to work. Actually (and that is a very disturbing thing to say), wars can really stimulate an economy when the country is involved but didn't suffer domestic devastation. The chart I posted in this post is testament to that. The troublesome SWRs in the US came from the 60s, while the war time was much easier (that is, for the SWR stats). Now for sure, if you look at international numbers, WW-II in particular is the core reason for the very low SWRs. And unfortunately, I do not think we should exclude such data points from our thinking. Notably with new forms of wars (including electronic) where geographic isolation and mighty military aren't going to be as effective as in the past. It probably doesn't change anything. 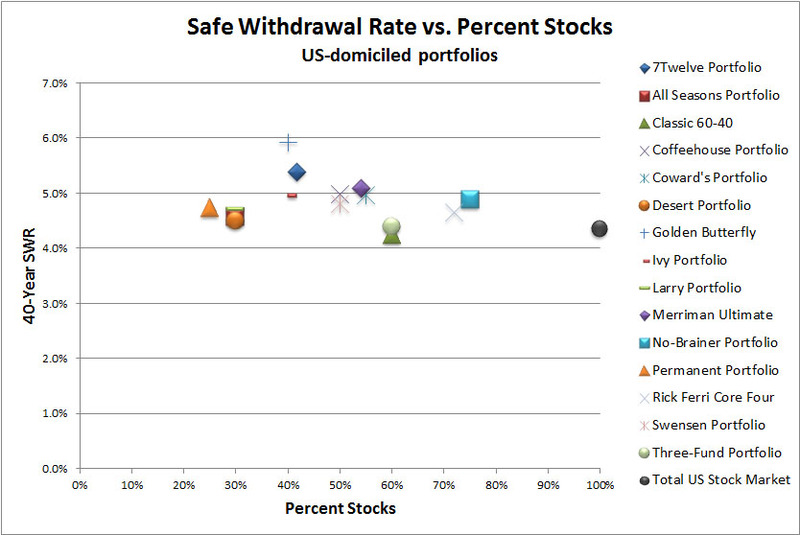 Asset allocation has very little impact on safe withdrawal rates in general. In another study (unfortunately, I don't recall which one) Pfau mentioned that to get the best SWR in most countries you need to use 100% equity. (Because bonds have been absolutely terrible in countries that were devastated by two World Wars.) He purposed picked the "best possible" asset allocation and the resulting SWRs weren't significantly different from the 50/50 mix shown in the link above. 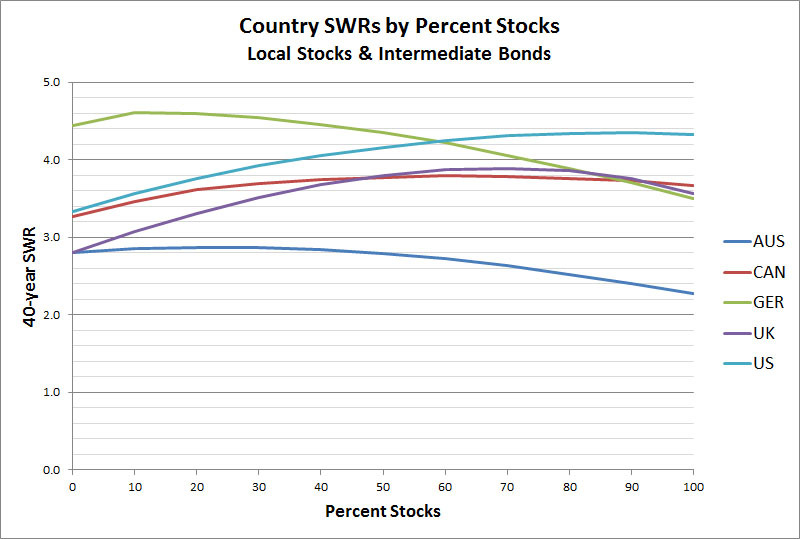 This chart from Tyler's post titled "Your Home Country is Inseparable From Your Withdrawal Rate" indicates that while the SWR for a 40 year period (using in-country stocks and intermediate term bondssince 1970) was between 2.4% and 4.6%, AA had a definite impact. In Germany and Australia, a 10-20% stock allocation was optimal, but 90% in stocks was optimal for the U.S. Canada and the UK's optimal stock allocation was around 50-60%. Now one might say that that's largely a function of how well each country's stocks performed, and the result would have been different for a global portfolio. 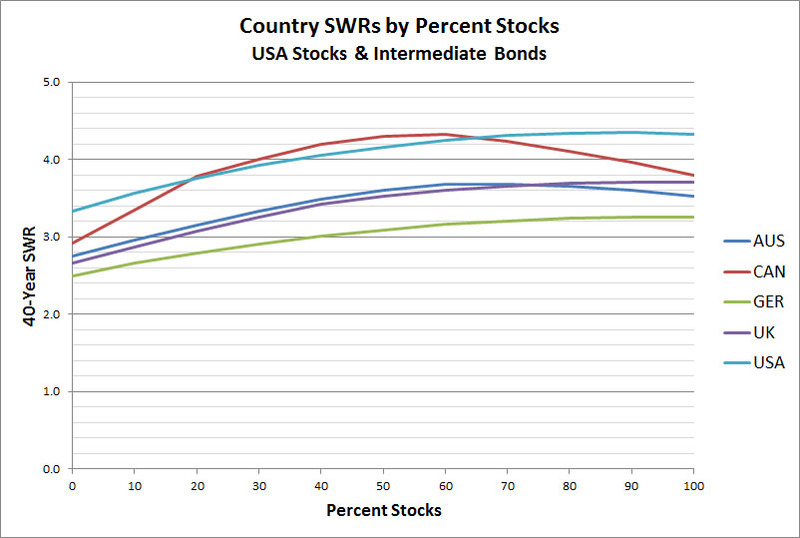 Tyler examined what the SWR would have been in each country had they all used U.S. stocks and bonds. Surprisingly, the optimal AA was not the same for all the countries. Here's his explanation for this interesting observation. So if the funds are exactly the same, what is driving the difference in withdrawal rates? Two things: inflation, and exchange rates. Remember, withdrawal rate calculations are based on the assumption of maintaining constant purchasing power. Both inflation and exchange rates can greatly affect that, and they vary quite a bit by country and over time. With inflation differences and exchange rate variations both affecting the results by double-digit percentages, it’s no wonder that simply buying US funds is insufficient to match US withdrawal rates for global investors. You can diversify your investments across assets and borders, but you can only live in one country at a time. And the inflation and currency in that home country matters a great deal to your financial security. In fact, I would suggest that the data provides a good argument for investing (at least partially) in your home country. Not only will that bypass the effect of exchange rates, but it arguably also helps with inflation. Local stocks and bonds are not perfectly correlated to local inflation by any means, but local inflation is far more related to the local economy than to one halfway around the world. Completely detaching the engine of your returns from the inflation it needs to account for may have negative consequences for your portfolio that you did not anticipate. So AA does have an impact on the SWR, but whether this is 'substantial' is a matter of opinion. And international diversification may improve your SWR, but some home country bias may be optimal in order to keep the impact of your inflated spending in check. I agree. I was inferring to being on the losing side of war. And having an incredibly low SWR to insure against that risk doesn't make much sense. There would be greater risks at play: death, confiscation, etc. Now, what I would like to see in these types of analysis is not only where SWR failed but why. What risk showed up. It's clear to me that risks that showed up in another countries did not show up in the US. I also believe that quite a few of these risks can be insured against with a diversifed portfolio and a slightly lower SWR. Unfortunately none of us have access to the (very expensive) annual data that would let us look at that. And it is the kind of speculative thing that normal academics are unlikely to care much about exploring. We can look at returns over different time slices and see if they help us form any guesses about the impact of World Wars. In the post-war period much of the US outperformance appears to have gone away. Over the same period, US returns were 6.6%. During the inter-war years, US outperformance appeared larger, which works against the "world wars are the root of all global equity problems" theory. Both were terrible but the US clearly did better. And during WW2, the US clearly did better. So AA does have an impact on the SWR, but whether this is 'substantial' is a matter of opinion. Indeed. And I think it is not substantial . Taking Australia as one of the more extreme examples, the difference between 100% bonds and 100% equities is what, 0.5%? 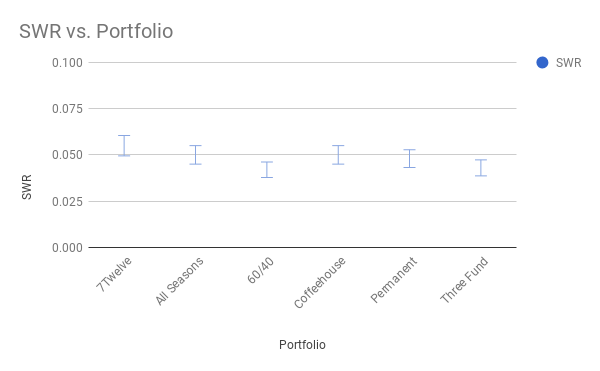 Using the stereotypical "$1 million retirement portfolio" that means the difference between the most aggressive and least aggressive portfolio is $400 a month in spending. And on Bogleheads people spend thousands of words arguing about asset allocation distinctions orders of magnitude less important than 100% bonds versus 100% stocks. To use the country with most variation based on asset allocation, in Germany the difference between 30% stocks and 60% stocks amounts to, what?, $4,000 a year or so. People spend years worrying about what exact glidepath to take from 60/40 to 30/70 in retirement and apparently it doesn't make much difference if you look at SWRs. Even extending it to 20% equities versus 80% equities we're talking about a less than 20% difference in your take-home income. Don't get me wrong, 20% is nice and all but....given the amount of effort people spend thinking, worrying, and arguing about asset allocation you think it would mean the difference between 2% SWR and 9% SWR. Now, you could argue that there is a big difference between a 100% bond portfolio and a 100% equity portfolio in retirement and using SWRs to measure that is a bad idea. I would agree with that. But when you just look at SWRs, it is hard to see massive differences in portfolios that actually are massively different. ... But I have also spent the last 7 years working like a dog and it has affected my marriage in a negative way. I have done great as far as saving money but now I realize that I have given up some great years in my youth that I will not get back. I have decided to take a huge chunk of what I have saved and start taking distributions from it - I've turned it into an income stream. By doing this I have cut back from work to less than full-time and am trying to maximize my 30s-50s as much as I can and worry less about my 60's-death, if that makes sense. I am okay with the possibility of eating cat food and living in a Medicaid facility in my old age if it means I lived life to the fullest while I had young kids and the health to do so. I'm curious to see how this pans out. I think anyone who saves a lot by their mid 30's can experience some sort of FOMO. I'm 35 and shifted gears over the last 4 years as well -- at some point we all realize time is not equal and the time today in our youth is worth far more than the time we are broken in old age (if we even make it). Do you find yourself happier starting portfolio withdrawals today and reducing to part time? had you considered just stopping saving all together (or perhaps just down to the 401k match) and see how that goes? That seems like an easier step than straight to part time and withdrawing from your nest egg so early. Do you mean 1920-1939 instead of 1920-1949 here? Yes, I agree that the SWR's wouldn't be that different. But I wonder what would happen with the success rates of the 4% rule if you use more equities than 50/50. Indeed. And I think it is not substantial . Taking Australia as one of the more extreme examples, the difference between 100% bonds and 100% equities is what, 0.5%? Fair enough, but start looking at more diverse asset allocations that account for investing options beyond a total stock market fund and an intermediate bond fund and it gets a lot more interesting. For sure, but this chart only addresses the 1970-now time period, right? Hence missing the really painful starting years like in the mid-60s. Hard to say what would have really happened to those 'lazy' portfolios by then. I would *guess* some of them would have made a true difference, but this is only that, an educated guess. I too have suspected that home country selection may help; but inflation is a cruel tax. I rember the 1970s all too well. Correct -- it covers 1970-present (the most data I have access to for so many assets). For reference, SWRs for identical stock/bond portfolios calculated since 1970 are only about 0.3% higher than those calculated since 1870, and the low point (in the US) was in the start year of 1966. But you're absolutely correct to point out that any statement of how a portfolio might have performed during a time for which we have no data is only an educated guess. My point is simply that not all stocks and bonds are created equal, and I believe asset allocation has a much larger effect on withdrawal rates than many people appreciate. You can change your e.g. equity allocation by 900% and it will only affect the safe withdrawal rate by 20%. That's not a highly leveraged decision; that's tinkering around the edges. In other words, the difference between the best possible portfolio and the worst possible portfolio (according to Safe Withdrawal Rates) -- over an entire 40-year retirement -- can be totally ignored if you are willing to work 12 months more. That's what I mean by it not being significant. The differences in SWR are quite likely overwhelmed by the margin for error in studies like this. (Do you always balance exactly? Do you always do on the first trading day in January and not on any other day of the year? Do you reinvest dividends immediately in the fund they came from? Etc.) Here's the same chart but with error bars, showing some of the best and worst portfolios. Well said. I think that's a very reasonable perspective. You also make an excellent point about the error involved and how the numbers are not so precise in the real world once you account for other everyday factors. I think that chart helps prove my point. A dozen portfolios that are wildly different and we're talking about approximately 20% different in annual income from best to worst. Furthermore, the SWR reasoning is really a bad case of (very narrow) tunnel vision. You are correct that the differences in return between Asset Allocations tend to shrink when looking at the worst possible retirement cycles (those leading to the lowest SWR). But then the differences expand as you look at the other retirement cycles. And in real life, the worst case doesn't happen very often, and it would be very silly to totally ignore the outcomes of the much more likely scenarios. Check again the chart I posted on this post. The lowest SWR is basically the same between the two AAs. The outcomes for almost every other year than the worst ones are quite different though. One has to plan for upsides as well as downsides. Furthermore, the SWR reasoning is really a bad case of (very narrow) tunnel vision. You are correct that the differences in return between Asset Allocations tend to shrink when looking at the worst possible retirement cycles (those leading to the lowest SWR). But then the differences expand as you look at the other retirement cycles. I completely agree with this and it was the point I was trying to make. Upon re-reading my post I didn't make that especially clear. I think SWR is a poor tool for investigating the impact of asset allocation. If you look at traditional SWR studies like Bengen or Trinity they show there's no difference in SWR once you get above about 20% equities. But if you look at actual withdrawals using a more realistic withdrawal strategy, it is hard to continue to support the "there's no difference" conclusion of SWR research. But none of those can be deduced from SWR approaches to retirement research; it shows the limitations of SWR and why it is hard to know what conclusions can be drawn from simply looking at SWRs and success rates. Your health is you lifestyle choices. You can live a very healthy active life to an very old age. At least that's what the science says. See nutritionfacts.org. It really depends on whether you think that any of these are going to bring you lasting happiness. The suntan fades, the shine goes off the new car, relationships end, etc. There is no lasting happiness in the senses. But there can be a great price to pay. I think SWR is a poor tool for investigating the impact of asset allocation. All righty, we're back in sync! Actually, at some point, I started to believe that SWR statistics were totally useless. Then I changed my mind. For a given cycle, you can use whatever variable withdrawal method you want, it is challenging to (without hindsight) get close to the outcome of the corresponding SWR (established in hindsight, for this specific cycle), but, on average, you can get fairly close if you accept some level of income variability along the way. Personally, I can relate to both of you. I have experienced the same stress related health and marriage issues. The workpace has changed a lot in the past 20 to 30 years. Due to offshoring and automation, wages have stagnated and companies are not loyal to employees. As a result corporate politics are more brutal than ever. Hence, a lot of the employment advice we were given as children no longer holds. -- Taking off weight. I am doing this by not carb/calorie counting, but by learning and practicing healthy eating and meal planning. --My marriage is gradually improving. For me, it has taken a long time to repair the damage to a neglected wife. -- I am only working 40 hours a week now. I am making only 60% of my former income, but I am no longer a corpoate serf. I am happier. -- I am still able to save for the future. I plan to retire at 62, take my Social Security at that time, and use a variable 4% SWR based on the size of my portfolio. Is that SWR optimum? Who knows! But it is good enough. I agree with you: Enjoyment is found by living in the present. If you are somebody ele's employee, work is the means to an end, not an end. Do not waste your loyalty on your employer. In today's economy, you -- the employee -- are a disposable commodity. Save your loyalty for your family, friends, church, and community. Last edited by GratefulinNC on Fri Feb 16, 2018 3:05 pm, edited 1 time in total. Curious on your age though in regards to starting Soc. Sec. benefits at 62. Farmer and I are both early / mid 30's. I plan on leaving that untouched until 70 as it is the most guaranteed form of income I ever be eligible for and I want to maximize it. Taking at 62 would be a huge swing for me given my age. I am 53. I have had a lot of loved ones who have had health issues and subsequently passed away at an early age. Therefore, just as you stated with respect to experiences, a bird in the hand is worth two in the bush. My philosophy is plan and save for the future, but make sure you enjoy your today. This is not easy. I have learned the hard way.